Welner Enabled aims to design and build products and devices that enable people with disabilities and chronic illnesses to access sensitive, compassionate, and thorough medical diagnosis and treatment. Welner Enabled, Inc. is dedicated to upholding Sandra Welner, M.D.’s medical engineering legacy of erasing obstacles confronting patients with disabilities. Dr. Welner introduced the initial Welner Examination Table in 1997 after spending countless hours consulting with patients to discover how to best accommodate people with disabilities. Inspired by the input of patients and caregivers, we designed the Welner Legacy Table, and introduced it in April 2004. 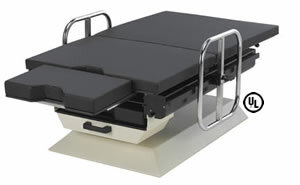 The Welner Legacy Examination Table is the first powered examination and procedure table that is extra-wide and able to support patients of up to 650 lbs. The Welner Legacy Table includes numerous innovations specific to the needs of today’s patients with disabilities, overweight, obese and morbidly obese patients, and those with impaired mobility. Welner Enabled, Inc. is a ‘C’ corporation, incorporated in the state of New York, U.S.A. We will continue to develop products geared toward enabling patients with special needs to receive thorough, accessible healthcare.